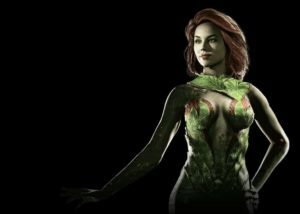 This page contains a character guide for Poison Ivy in Injustice 2. Here you’ll find movelists, combos, juggles, strategy guides and recommended gear for the villain character. For more Injustice 2 content, head over to our Injustice 2 top page. Dr. Pamela Lillian Isley, a botanist from Seattle, was experimented on by her professor, Dr. Jason Woodrue. The experiments placed toxins in her bloodstream that gave her a toxic touch and an immunity to all poisons, viruses, bacteria, and fungi. The experiments also granted her the ability to produce mind-control pheromones that allowed her to control men. Enraged at his betrayal, Pamela suffered violent mood swings. Following the death of her boyfriend, Isley dropped out of school and left Seattle, eventually settling down in Gotham City, where she became known by the public as Poison Ivy and clashed frequently with Batman. Poison Ivy takes less damage while Rhytidome Skin is active. Poison Ivy summons her Plant Minion that spits deadly ooze at the opponent. Below are combo and juggle inputs for Poison Ivy , including corner strategies and restarts. Her cell in Arkham Asylum and in Joker’s Asylum are seen and used as environmental hazard for the player to use. For gadget types, a player steps on a flower and squirts poison at the opponent. For power types, they throw one of the flowers at an opponent.